We now sit in the longest bull market in history, and trusting that it will carry on indefinitely is as implausible as presuming that the oceans are held back by vast ice walls. Wall Street is plagued by the prospects of mounting inflation, slowing growth, debilitating trade wars, and interest rate hikes. In September, Goldman Sachs’ “bear-market” risk indicator rose to its highest level in almost 50 years. Morgan Stanley announced that we’re in a rolling bear market that could cripple stocks indefinitely. And JP Morgan Chase warned that the liquidity binge of the last ten years has set the stage for the next financial crisis. Even Warren Buffett – one of the most successful investors of all time – warned his stockholders that stocks will experience declines in the range of 37% to 59% and that we’ll have little or no warning of when that will happen. Flat Earthers will tell you that the earth doesn’t seem round – rather, it “feels” flat. Blind Faith Bulls will tell you that the market doesn’t seem weak, rather it “feels” strong. The Bank On Yourself strategy provides “crash-proof” wealth protection and is based on the 160-year-plus safety track record of high cash-value dividend-paying whole life insurance as a foundation of financial security. But it’s not just a lockbox for your hard-earned dollars to sit idly. You benefit from guaranteed and predictable growth – your cash value is guaranteed to grow by a larger dollar amount every year. 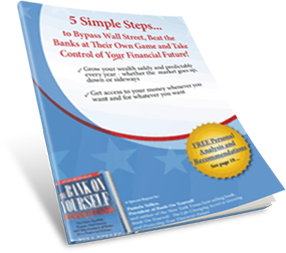 Bank On Yourself offers built-in protection from those things we all know will happen – inflation, deflation, and the inevitable downturns and major market crashes. The current economy is the product of all of these sentiments, as it rides high on tax cuts, unfettered fiscal spending, and extreme stock market valuations. But as the Fed tightens and our national balance sheet lightens, these factors will fade and cyclical forces will once again prevail. Gravity is real. Crashes are inevitable. Having a good chunk of your savings in a Bank On Yourself plan gives you the predictable growth and safety that traditional saving and investing strategies don’t. Your principal and growth are protected, and you have a multi-layer financial safety net to cradle your nest egg. You also have any-time-you-want-or-need-it access to your money – no questions asked. It’s easy to find out how the Bank On Yourself strategy can help you reach your financial goals and dreams – without taking any unnecessary risks. You can know your bottom-line guaranteed numbers and results before you decide if it makes sense to move forward. There’s no cost or obligation, so request your free Analysis here right now. Don’t reject the body of evidence and telltale trends that have long demonstrated the cyclical nature of Wall Street. And for the record, Columbus never believed the earth was flat. When he left port in 1492, he defied his Spanish patrons and set sail to the west instead of the east – precisely because he knew the world was round.